Softball player Jenna Maury and men’s basketball player Ben Gardner headlined a group of 15 honorees at the fifth-annual HOPEYs ceremony Monday at DeVos Fieldhouse as recipients of the Karen Page Courage Award. The Karen Page Courage Award honors beloved former Hope women’s tennis coach Karen Page, who lost her brave, five-year battle to breast cancer in the summer of 2009. Maury, pictured top left, and Gardner were recognized for their courage in helping to start charitable efforts and continuing them while being student-athletes at Hope College. Maury, a junior shortstop from Lawton, Michigan (Lawton HS), began Buddy Bags Inc. that provides backpacks of food for needy youth in her hometown. Gardner, a junior guard from Carmel, Indiana (Carmel HS), has teamed up with a childhood to run Jesse G. Clothing that currently is raising money to build a library in Ethiopia. HOPEYs award recipients are listed below. More information about each recipient is available from Hope College Athletics. 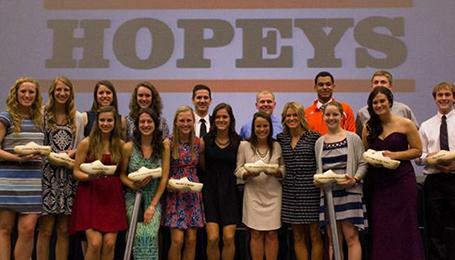 View a photo gallery from the HOPEYs ceremony by student photographer Monica Dwyer.